When my recent trip to California was being organised, like most golfers I was checking out the courses as they came through and started to load them up on my GPS system after paying the extra amount I needed to get the worldwide coverage package. When the final itinerary came through I had 21 courses to play and my GPS only held 20 courses – umm what to do? Then a package was delivered with the new Nikon Coolshot rangefinder to test (It would have helped if it was a week earlier and I wouldn’t have had to pay that worldwide subscription!) So out went the GPS and in went the Nikon Coolshot and what a great decision that turned out to be. No worrying about charging or if the battery would last the 36 holes, which I was playing every day for the first six days of the trip. All I had to do was pull it out of the bag, aim it at the flag, bunker or hazard get the yardage and off I went. I have not used a rangefinder in the UK yet, but the Americans have these reflectors on the flag sticks for the laser to pick up so getting a yardage that is precise is so easy, but what made the Nikon Coolshot even better was how compact the unit is and how easily it sits in my hand. 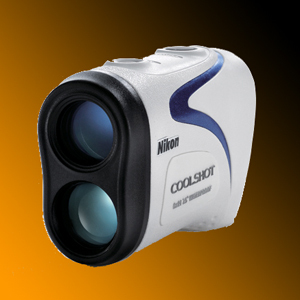 I had a lot of American golfers who were using their own rangefinders, having a go with the Coolshot. They have been using rangefinders a lot longer than me and they were remarking on how clear and powerful the magnification was and how lightweight and easy the Coolshot is to use. 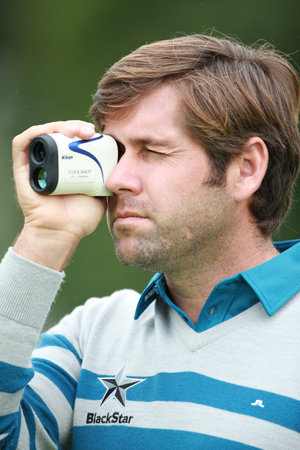 As I said I have nothing to compare it with, but I was certainly enjoying using this little gadget and because I have to wear reading glasses, I was more than impressed with it’s adjustability to my eyesight, so I had a perfect image for my eyesight to laser at, get my yardage and make my decision. 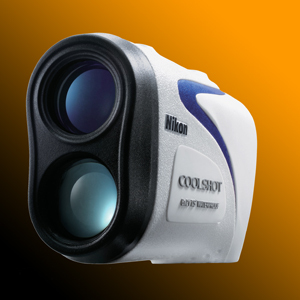 The Coolshot is a compact, lightweight and ergonomically designed to fit in the palm of your hand. It has a range of 11 – 600 yards and for those who play their golf on links courses in the Great British weather the good news is it’s waterproof for 10 minutes to a depth of 1 metre. And the battery chamber is also water resistant. So if you do manage to fall into a water hazard, you should be good to get a yardage from there!! The 18mm ocular helps for easy viewing of the selected target and it also has a wide field of vision at 7.5°. A press of the power button gives you an 8-second continuous measurement to work with which I found really useful as you could take readings from several different objects, which helped with my club selection thought process. The bright clear images that the Americans were commenting on come from Nikons high-quality 6x monocular with multilayer coating, which offers the user a brighter field of vision. Well my first thought goes to the money I could have saved if this had come through sooner, but for anyone with a GPS system I would highly recommend you get a hold of one of these and have a go. No need for yearly subscriptions, the only thing you need to buy is a battery once the one it comes with gives up. For those of you, like me who travel to play golf, I now know a rangefinder is a no brainer and with the Coolshot you get a lightweight, very portable, easy to use rangefinder that fits snuggly in the palm of your hand, offers a clear image and superb magnification. The 8-second continuous measurement is fantastic, it helped me gather all the information I needed to help my shot making decision.